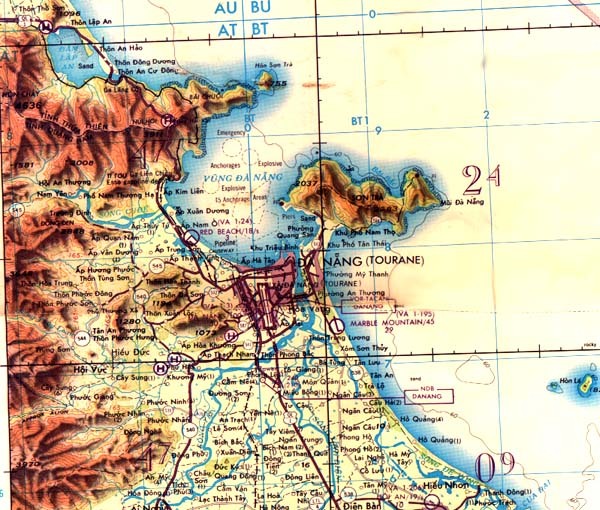 Da Nang carried the nickname of "Rocket City" for good reason. The Viet Cong with the arms and assistance from the North Vietnamese Regular Army frequently launched Soviet manufactured 140 millimeter rockets into the air base from positions within six miles of the runways. 120 MM rockets replaced the larger 140s in mid 1967. The rockets were almost always launched at night which provided the greatest surprise and the most damage to both equipment and troop morale. I personally was a target of three night rocket attacks at Da Nang in 1967 when assigned to the Death Angels of Marine All Weather Fighter Squadron two thirty five. 2-27-67. The time was 3:10AM on February 27, 1967 that I was introduced to Soviet surface to surface rockets. Following a 2AM diarrhea run to the 10 hole outhouse I was lying awake on my cot in our four man hootch at the Marine Air Group Eleven compound 100 yards west of the Da Nang dual runways. My thoughts were on my wife and three small kids back in Pensacola, Florida carrying on life without me. A shrill whistle got my attention. Multiple loud whistling noises joined the original sound. The whistling was overhead! I jumped off the cot and shouted, "Incoming! Hit the bunker! Incoming! Move it! Move it!" I grabbed my .38 Cal. revolver and ran for the bunker adjacent to our hootch. My roommates, Eagle Ridings, Rocky Plant and Colin Ruthven mumbled "Crazy. Nuts!" and remained in the security of their bunks. The whining rockets were really loud by the time I cleared the hootch door and as I dove into the bunker, the rockets were impacting the runways and taxiways just east of our hootch. WHOOOMP ! WHOOOMP! WHOOOMP! Security sirens commenced wailing. More rockets exploded! WHOOOMP! WHOOOMP! My three hootch buddies suddenly were landing on top of me as they dove into our sandbagged bunker. I was nearly crushed by the pile of pilots. Being the first into the four by six bunker had it's drawbacks. The rockets continued to walk up the runways. WHOOOMP! WHOOOMP! WHOOOMP! When the explosions stopped I commandeered the duty officer's jeep and hurried to the east side of the runways. East of the runways was commonly referred to as the Air Force side even though our hangar and flight line were located on the north end of Air Force side. Six of our VMF(AW)235 Crusader aircraft had shrapnel damage. One Marine was killed at our refueling site. The Air Force did not fare as well with 14 reported killed and 35 wounded. 300 Vietnamese civilians were killed by several rockets that overshot the Air Base and landed in the adjoining village. Rocket City was named! 3-15-67. The next rocket attack occurred on March 15. I reported to the Hotpad Alert van adjacent to the flight line at 7PM. After sitting on alert for four hours without a scramble, I assumed the prone position in one of the four bunks provided and was asleep by 1AM. Promptly at 2:10AM I was awakened to dull thumps that shook the van. It was like someone was hitting the side of the van with a sledgehammer. The sounds got increasingly louder with each "Whump!" I awoke thinking I was being aroused for a hotpad scramble. WHUMP! WHUMP! The explosions became ever louder and the van shook heavily with each impact. I jumped off the bunk and slipped on my boots with the quick zipper sides while shouting at the other sleeping pilots, "Incoming! Fire in the hole! Hit the bunker!" WHUMP! WHUMP! I grabbed my pistol and leaped out of the van. A rocket exploded on the runway about 100 yards away. KA-WHUMP! I raced toward the flight line as the 140 MM soviet built rockets came ever closer. KA-WHUMP! That last rocket landed at the end of the flight line. The flight line bunker was full of maintenance personnel. I turned and ran for the bunker 50 yards away behind our hangar. Four more rockets impacted on the runways. Some were contact fused which did no damage while others were delay fuses which dug deep craters in the concrete-asphalt surfaces. A Death Angel F-8 was trying to land as the attack started. He was diverted to Chu Lai. The Air Force responded by launching two C-47 Gunships [Puff the Magic Dragon] on the last 3000 feet of runway during the final explosions. Then it was over as suddenly as it had started. We watched the gunships south of the air base hosing down suspected rocket launching sites. At 18,000 rounds per minute coming out of each of their three gatling guns, each C-47 had tracer fire resembling three streams of red liquid fire pouring down on the enemy positions. And, only every fifth round was a tracer. The fuel pits had flames shooting high into the black sky for several hours. I was worried that we had many planes ruined. A careful inspection revealed no damage to our Crusaders. General Robertshaw arrived at 3AM. The runways were soon cleared of debris and I was the first jet aircraft to depart Da Nang. It was at 4:15AM. My targets were suspected rocket launching sites 5 miles south of Da Nang. General Walt ordered us to immediately move the Crusaders over to the west side in the newly built Marine parking revetments. Only 19 Americans were wounded by the 14 Communist 140MM rockets. Only two aircraft were damaged and one of those was on takeoff roll when a rocket hit a heavily loaded Air Force F-4. The crew caught the overrun wire and the Marines defused the bombs and put out the aircraft fire. It was 5:15AM when I landed from the bombing mission. I debriefed with S-2 and stopped at operations to tell them I was going to my cot. The Ops Officer said, "No you aren't. We have two pilots injured jumping into bunkers last night. You are on standby!" My day got really long when I launched at 10:30AM. It was noon before I landed. That wasn't the end. I hit my cot at 2:30PM and slept till 5PM when I went to dinner. I had a midnight launch and then the night hotpad from 2AM until 7AM. Why the hell can't I Just get some sleep? 7-15-67. The biggest rocket blast from the past occurred on July 15, 1967 when once again I was in the Hotpad Alert van. Da Nang Air Base had intelligence predicting a rocket attack any day. On my second combat hop on the 14th I flew below 500 feet for 30 minutes 5 to 10 miles south of Da Nang searching for rocket launching sites. Suspected excavations camouflaged with tree branches were seen on a peninsula 6 miles southwest of Da Nang. I briefed S-2 and Operations sent out Force Recon in helicopters but they could not find the sites. 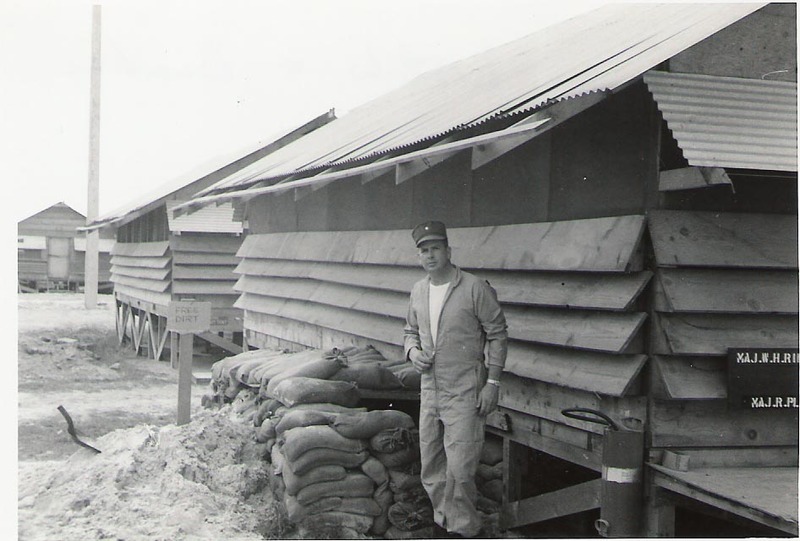 VMF[AW]-235 Aircraft Maintenance had daily emergency reaction platoon assignments and a Maintenance Duty Officer to post the riflemen at the bunkered outposts on our perimeter of responsibility. My ground maintenance officer wanted to attend a dinner party with his OCS classmates at Marble Mountain helo base on July 14. "Forget it!" I said. I reminded him that he had maintenance duty officer at the squadron hangar that day and we were expecting a rocket attack that very night. I was scheduled for a TPQ mission at 2AM so I went down to the hangar at 9PM and hit the sack in the hotpad van for a couple of hours sleep before launch. Whistling rockets rudely awakened me at 12;15AM. WHUMP! I shouted "Incoming! Incoming!" and ran out of the van. WHUMP! A rocket hit 15 feet in front of me. It had passed over my left shoulder missing me only a few feet before the contact fuse detonated the rocket. The shrapnel sprayed forward out 50-75 meters in a teardrop shaped pattern of white, ice blue, and red roman candles which bounced, curved and ricocheted off vehicles, ordnance, and revetments. KA-WHUMP! I raced into the hangar to the duty officer's post. An NCO was at the desk and reported that he was the assistant duty officer and that the duty officer had gone to Marble Mountain. VMF[AW]235 was the last squadron at the north corner of the base. Only a barbed wire fence separated the Marine squadrons and the northwest corner of the air base from the civilians outside and sapper ground assaults normally followed mortar and rocket attacks. Our squadron emergency reaction platoon had to be positioned at the bunkered outposts on our perimeter of responsibility. KA-WHUMP! KA-WHUMP! The rockets continued to impact all around our hangar and revetments. I mustered the reaction platoon from various bunkers in the maintenance area and rushed them to their defensive positions on the fence line. Light was provided from two Crusaders burning fiercely from direct hits in revetments. The remainder of the troops were directed to bunkers. I ran back to the van and rang the Command Post. I reported our perimeter of responsibility secure and also reported the aircraft burning and damaged. KA-WHUMP! The hangar took a direct hit with a contact fuse and shrapnel sprayed throughout the interior. Many planes and equipment were damaged. KA-WHUMP! KA-WHUMP! Dozens of rockets were exploding on both sides of the Air Base. Fires were raging in all quadrants. I was standing outside the van with the field phone in one hand and my .38 revolver in the other when two figures loomed from the shadows of the edge of our fuel pits. I shouted, "Halt and identify yourself!" Two young officers identified themselves as air crew members who were just taking off for Iwakuni in a C-117 when the rockets began striking the Air Base. The runway was cratered by direct hits. I pointed them toward nearby bunkers that were already full of personnel. WHUMP! The rockets were coming less frequently. I rounded up some ordnance men and gathered fire extinguishers. We went into the hangar, the revetments, fuel pits and working areas putting out fires and assisting the injured. About 20 minutes after the initial rocket impacts, a sudden extremely bright flash turned the night into day like an atomic bomb detonation. A shock wave hit the hangar and the personnel outside of bunkers. The force propelled men against revetments with such force that they were injured. I was thrown thirty feet into a steel Conex box like a rag doll. The hangar blew almost over. The blast and heat felt a searing 200 or more degrees. I limped back to my field phone and could hear shouting coming out of the headpiece before picking up the receiver. I said, "What the hell was that?" JI [Fly] Cunningham at the other end of the line said, "I think it was the Air Group bomb dump going up!" He was right. Every bomb and rocket in the dump which was directly between the four squadron flight lines and the Group headquarters went up in a mighty explosion with fire and debris rising thousands of feet into the air. Shrapnel rained for what seemed like minutes after the blast. The runways were closed for 12 hours. The rocket and mortar barrage on July 15, 1967 was the most costly attack of the war at Da Nang. Someone up the line wrote me up for a Bronze Star for my actions during the attack. The citation also provided me a supporting document for award of the Combat Action Ribbon. I was the Squadron Maintenance Officer at the time and considered the actions I took as part of my job to insure the safety and welfare of my troops and the security of aircraft under my cognizance. Sitting in a bunker would not have been performing my duties. Duties that included acting as duty officer since my duty officer had disobeyed orders and gone to a party with his buddies. I wrote the officer up for disobedience of a lawful order and unauthorized absence. He was given Office Hours [non judicial punishment] and received a letter of reprimand. A soft touch from a new commanding officer. Two weeks later I was transferred to Saigon as Marine Liaison Officer to MACV and 7TH Air Force.